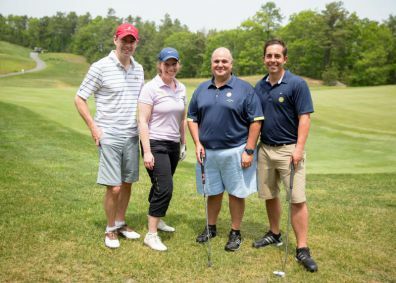 Perfect weather welcomed 280 golfers from over 70 firms as executives from the financial industry gathered at Pinehills Golf Club in Plymouth, MA on June 11, 2015 for the 21st Annual Expect Miracles East Coast Classic. With the continued support of its Foundation Sponsor, Interactive Data, Expect Miracles Foundation has sold-out their past three signature events. This year’s East Coast Golf Tournament proved to be yet another wildly successful endeavor to raise critical funds in the fight against cancer. Frank Strauss sinks the putt to get into the Finals! Vestmark CEO John Lunny congratulates Sam Bush (Vestmark) for winning the Putting Contest! Chairman Frank Strauss with Expect Miracles Foundation Director Terri Labrecque (BNY Mellon), recipient of the Expect Miracles Award. Expect Miracles Foundation Director Scott Brady (Merrill Lynch) and John Ferrick (Dreyfus) - winners on the Nicklaus Course! 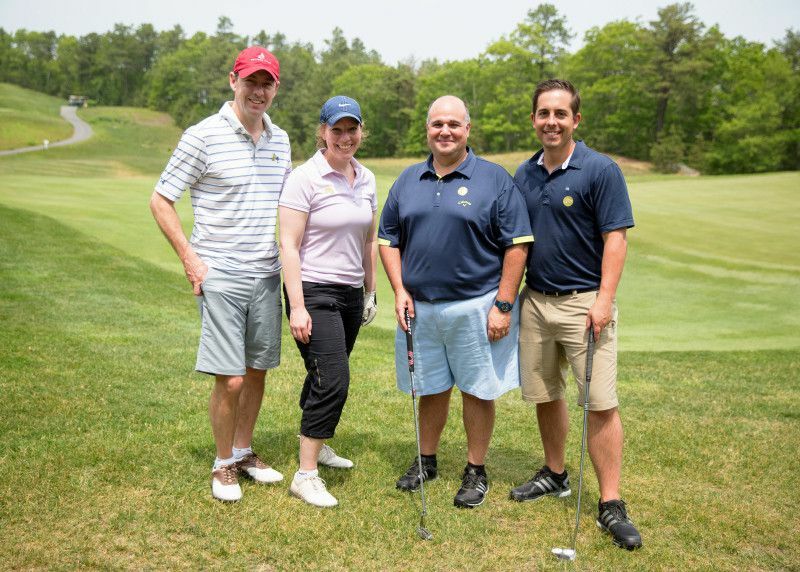 In the modified scramble tournament, first place went to Scott Brady, from Merrill Lynch, John Ferrick, Chris Lacey, both from BNY Mellon, and Zach Lacey. The winners of the closest to the pin contest were Jonathan Dale from SEI, and Michelle Loranger from State Street. Brett Fernquist from State Street, and Nancy Rowe from the Jimmy Fund won the longest drive contest. In the scramble tournament, the first place prize was claimed by the foursome of Mal Cullen and Greg Farrington from Eagle Investment Systems, Mark Spanos from Beacon Consulting Group, and Jesse Santos from BNY Mellon. Pat Mullins from US Trust and Karan McClimans from T. Rowe Price were closest to the pin. Keith Slattery from JP Morgan and Katie McKay from John Hancock proved that they could hit the long ball by winning the longest drive contest. Sam Bush from Vestmark won a hotly contested putting contest over runner-up Steve Kelly from Franklin Templeton. During the post-golf reception, Frank Strauss, Founder and Chairman of Expect Miracles Foundation, thanked the sponsors, guests and volunteers for making the annual Classic a great success. He then presented some deserving awards. Terri Labrecque from BNY Mellon received the Expect Miracles Award for her instrumental role in the Foundation’s momentum and impact by leading her company’s corporate support and rallying her colleagues. Karan McClimans from T. Rowe Price accepted the CJ award, named in honor of cancer survivor Christopher M. Johnson, for her humble and unwavering support of the Foundation as an active member of the MMLC and volunteer. Chas Goodman from State Street was recognized with the first-ever YPEM Award for his outstanding work rallying colleagues and fellow young professionals in the industry. In recognition and appreciation for the steadfast dedication of an entire company, Andrew Hausman, President, Pricing and Reference Data accepted the Foundation Award on behalf of Interactive Data. The play-by-play voice of Boston College Football and Basketball, Jon Meterparel, emceed the live auction, where generously donated packages such as Taylor Swift concert tickets, an autographed Ted Williams photo, and a private charted yacht were bid on to support the fight against cancer. In appreciation for their participation in the tournament, the Foundation presented golfers with Expect Miracles Foundation gift bags containing performance socks, Puma Soundchuck Bluetooth speakers, and a merchandise credit to stylish custom-fit clothiers Ellie Kai or Blank Label. On the links, guests had the opportunity to sink a hole-in-one for a getaway to beautiful Bermuda, courtesy of Gosling’s Rum and Elbow Beach Bermuda, as well as test their putting prowess to win a golf and spa vacation package at Stowe Mountain Resort. One lucky player won a shopping spree to Tommy Bahama in the dramatic helicopter ball drop contest. With the united support of the financial community we are able to further our mission and take steps together to save and improve the lives of cancer patients. Frank Heavey, Executive Director of the Foundation, concluded the night by thanking our sponsors, volunteers, donors, and golfers who all played a vital role in the tremendous success of this year’s sold-out East Coast Golf Tournament. We hope you can join us for our next event, the West Coast Classic, on October 22, 2015!